40X80 Revival Tent For Sale! 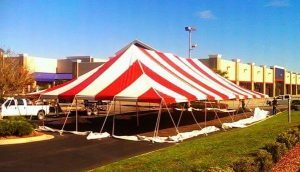 Worldwide Tents is offering this used 40X80 Revival Tent for sale as a complete package including sidewalls, steel poles, stakes, ropes, and storage bag for the tent top! Contact us now for details and pricing on this used red and white 40X80 Revival Tent! Contact us with the contact form on this page or call us at 407-579-7187! We Ship Tents All Over The World! Call Us Today At 407-579-7187 Or Fill Out Our Form!